I’m sure I’ll be surprising absolutely nobody when I say the seemingly never-ending feud between Nicki Minaj and Cardi B lives to see another day. Cardi posted ten – yes, ten – videos to her Instagram account yesterday (October 29), calling out the Superbass rapper, offering to fight their issues out in person. The feud came to a head on September 7 when the two rappers attended the Harper’s Bazaar’s ICONS party and got into an altercation. Cardi was pictured leaving the event with a huge bump above her eye and footage of the ‘fight’ on TMZ, appeared to show her throwing a shoe at Nicki. Eyewitnesses described Cardi as ‘aggressively’ approaching Nicki, saying ‘let me tell you something’, before making a lunge for the singer. Security at the event apparently managed to stop her before she got to Nicki. Since then, the feud has continued in the form of Twitter digs and Instagram call-outs, with insults going back and forth regularly. The latest, being Cardi’s recent posting of ten videos, posted one after the other in fast succession, confronting Nicki about everything that’s been going on. The reason for her social media tirade was apparently because Nicki had gone on her Queen Radio show and claimed Rah Ali – Nicki’s close friend – beat up Cardi during the brawl last month. She goes on to say Nicki needs to choose whether she’s a victim or a gangster, stating she keeps going back and forth between the two. And it doesn’t stop there. 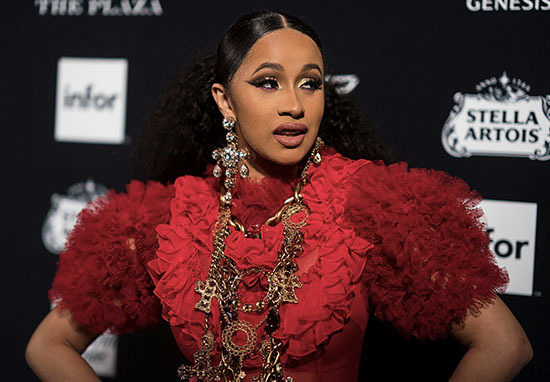 Throughout the videos, Cardi attacks Nicki for many things, including allegedly leaking her number to people who then sent abusive messages to the rapper and ‘snitching’ on her for saying she’s going to sue as a result of the altercation. Cardi also made reference to Nicki’s claims she was offered her Fashion Nova deal more than a year before Cardi was, and stating she declined to be on Little Mix’s recent Woman Like Me record before Nicki was asked to feature on it. If you really wanna talk about it, you know where to link me… We could talk about it, or we could fight it out. I’m with whatever. Yikes. And Nicki wasn’t letting her off that easy – she’d already written and posted a response to Twitter an hour after the videos were posted. She called Cardi out for being a ‘fkn fraud’ and told her to ‘write a rap’ instead of focusing all her energy on the ongoing feud. So who knows, maybe that’s the end of the feud and both rappers will go their separate ways and never speak of it again?